Proto-type Theater’s new show The Audit (or Iceland, a modern myth) looks at the human cost of the corporate and personal greed that consumes countries – and tells how one nation raised their voices in protest and railed against the currents. How can a small island nation survive when it is going it alone with economic relationships? Teeside audiences will be able to see this exciting new show at ARC, Stockton-on-Tees on Thursday 1 March. 2018 marks the tenth anniversary of the worst worldwide financial crisis since the Great Depression of the 1930s and The Audit asks if we really weathered the storm? Surrounded by greed and with international finance crashing, we follow a citizen, a country, and gods old and new, as they confront economic crisis and powerlessness. The Audit uses original text, performance, film, animation and specially composed music to inform, entertain and challenge. In a world where the driving force behind nearly every decision that affects our daily lives is profit The Audit is about finding strength, overcoming a world designed to keep us docile, and seeks to show that collective power can move a mountain – even if only a little. 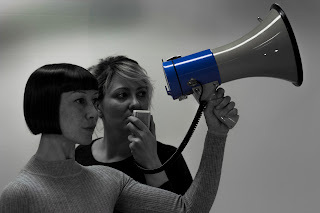 Written and directed by Andrew Westerside and devised and performed by Rachel Baynton and Gillian Lees this is Proto-type’s second theatrical work examining contemporary politics. A Machine they’re Secretly Building, a ‘smartly intelligent hour-long whizz through the world of surveillance’ (Lyn Gardner, The Guardian) thrilled audiences and critics alike on tour and was selected for The British Council Showcase at the 2017 Edinburgh Fringe. The Audit reunites the team with digital design from Adam York Gregory (‘so seamlessly incorporated into the action it’s almost another performer’ Exeunt) and original music and sound design by Paul J Rogers. Proto-type are a company of multi-disciplinary artists led by Rachel Baynton, Gillian Lees, and Andrew Westerside. They have been making work and supporting young artists in the US, the Netherlands, Russia, China, Armenia, France, Zimbabwe and the UK since 1997. The Audit (or Iceland, a modern myth) was commissioned by Lincoln Performing Arts Centre, ARC (Stockton), Oxford Playhouse, Lancaster Arts at Lancaster University, hAb/Word of Warning (Manchester) and artsdepot (London). Supported by Tramway (Glasgow), Curve (Leicester) and Arts Council England. New show from acclaimed company Proto-type Theater tells the story of how a nation raised their voices in protest, and how collective power can move a mountain – even if only a little. Age 14+ 60 minutes, no interval. £pay what you can www.arconline.co.uk 01642 525199.